The Job Creators Network, one of the country’s largest pro-jobs grassroots organizations, scorched Democratic Rep. Alexandria Ocasio-Cortez (D-NY) with more massive New York City billboards after the Senate voted down the Green New Deal bill, 0-57. 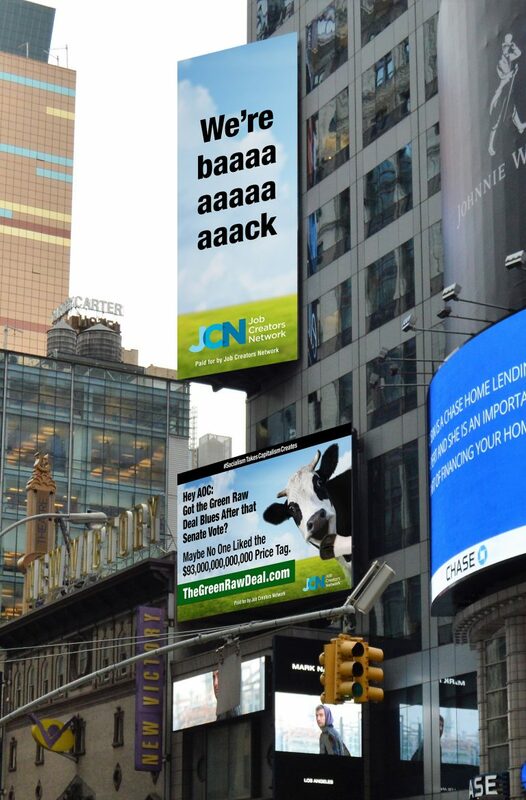 “The first billboard humorously says ‘We’re baaaaaaaaaaaack’ — highlighting the enduring presence of the JCN ads in Times Square. The second calls attention to the massive cost associated with the Green Raw Deal—saying ‘Hey AOC: Got the Green Raw Deal Blues After that Senate Vote? Maybe No One Liked the $93,000,000,000,000 Price Tag. '” the Job Creators Network said in a press release. The organization has relentlessly mocked the freshman rep. over her $93 trillion Green New Deal plan. Last month Job Creators Network dropped a billboard in the middle of Times Square aimed at Ocasio-Cortez’s support for Amazon’s decision to not move it’s new headquarters to New York City. 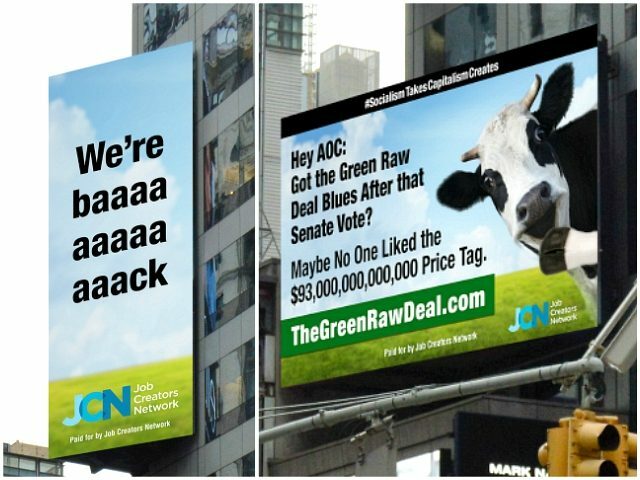 Weeks later, JCN erected two more billboards slamming Ocasio-Cortez’s “disastrous,” $93 trillion Green New Deal.